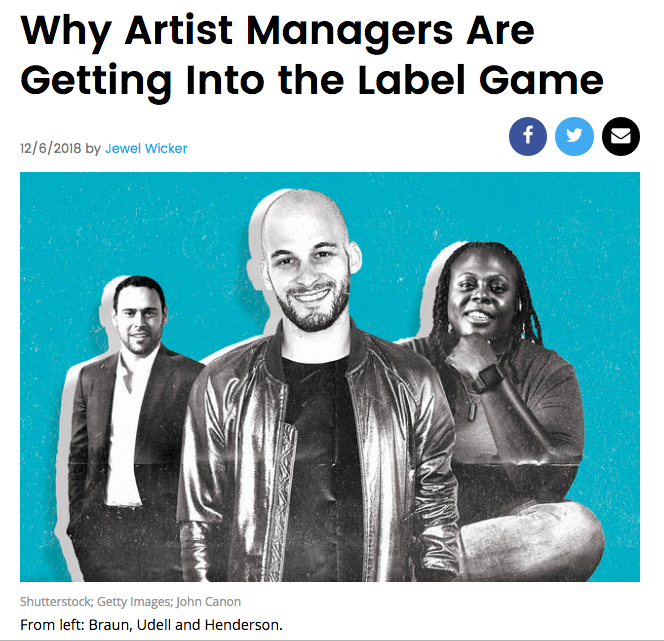 When Jewel Wicker reached out to speak about an article she was drafting about managers becoming record labels for Billboard, I was hesitant. I love Billboard and this is an important story to be told, but since it has been a year of re-building for our company, the last thing we’re looking for or need during a time we feel we have so much to prove is press… But we recently signed a remarkable talent named James Vickery and he deserves his story to be in the spotlight so I decided to speak to Jewel. I never dreamed of starting a label. There were too many times where I believed in my artist and their music more than the label the artist was signed to. There were too many times I felt we (the artist, my team and I) were prepared to put in more work to grow the artist than the label. There were too many times we were told “no” on getting approval for essential marketing initiatives, which would clearly drive growth. I had an artist who spent almost $1MM in 360 payments over two years… Only to be told our proposed budget of $15,000 for a music video for a single was not approved. We were asked to decrease the budget to $10,000. I’ve seen labels not approve remix packages for small fees where the copyrights will be clearly be worth more than the fee and no further marketing is expected from them. I have had great working experiences with labels too! But when the above scenarios take place, I feel dumbfounded and helpless. Major labels still control the charts and play a critical role in the trajectory of just about every top song in the world. Even if they are no longer the gatekeepers, they still have the key. I’m not sure if this will change anytime soon or not… It depends if enough independent labels choose to retain their independence and reach a considerable amount of success. For an artist, the only thing scarier than being signed to an indie label where there is such a slim chance of breakout success is being signed to a major label where you’re breaking, but don’t have the global support of the company. There are all different degrees of management. I have always been intensely involved in the marketing strategy, positioning, and promotion of our artists. Over the years, as new artists were presented to me, I realized it may be too early for them to sign with a major label, but they still needed funding. Without it, success as their manager may not be possible. The only incentive to reward the level of financial and time investment was to start a label. We are not going to be the right label fit for all of our management clients for too many reasons to dive into here. Furthermore, we believe our continued investment and learnings from our label, will only make us more dynamic managers in our continued pursuit to represent the most talented artists in the world. The digital ecosystem has enabled labels to be born without having to think about manufacturing and physical distribution. Instead, our team can focus on artist development, astute investment, and creative execution. I’m beyond grateful to the artists who have entrusted us at TH3RD BRAIN Records to execute in these areas. I look forward to making our mark together in the years to come. Let’s get to work.